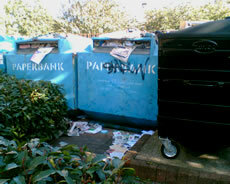 Unbelievably, the newspaper recycling bins at Morrisons still remain full. A piece about the startling contrast between the bins in Morrisons versus the bins in Waitrose in West Ealing was published on this website on September 29. Neil Dhot, Head of Communications at Ealing said at the time that steps had been taken to ensure that "the problem should now be resolved." 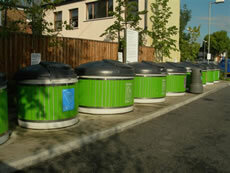 On October 2nd the bins had still not been emptied and this was again reported to the Council. Apologies and reassurances were once again issued. Rubbish behind one of the recycling bins has still not been cleared, though there are signs that there has been an effort to tidy the area. The Council's contractor until recently for collecting the recycling from Morrisons was Abitibi who were fired due to 'substandard collection performance'. The company now responsible is apparently ECT. Ealing Council has been silent - there has been no explanation as to why residents of Acton are fighting a tiresome battle against an inadequate service. We continue to view with envy the well-run, attractive and extensive recycling facility in Waitrose, West Ealing which could be used as a standard for all recycling facilities at supermarkets in the borough.